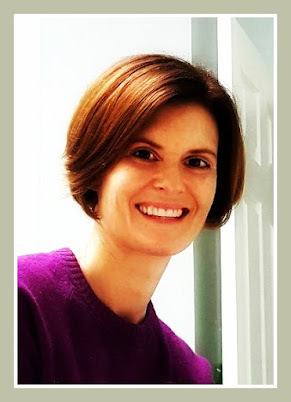 When I met Anna, her blog was new to me. I hadn’t heard about her or her experience. I quickly learned that her life contained a tragedy, the most tragic thing that every parent dreads: she lost her son. Three years ago, twelve-year-old Jack died in a flash flood that carried him away from this world and the embrace of his family. I can’t imagine living life after that. I considered that Anna was a member of that upper level of humans, with those who possess a genius IQ and supreme talent. She was chosen to live this life for her strength and the ability to shine through the darkest of life’s challenges, to show average humans what it really means to endure. She’s out of my league. I can’t even bear to think of losing my children, yet here she is: doing great things through her life and work, and successfully surviving – no, accomplishing, thriving – after such a loss. I’ve never been good at sharing grief; when confronted with another person’s loss, my instinct is to stay away, offer sympathy from afar, allow privacy. My own awkwardness and unease overshadowed many past attempts to comfort others in their loss. Sitting with someone while they mourned – I told myself that this was not my place, my role. Surely there is another more qualified. I’m just in the way. It took me a while to read Rare Bird. I had volunteered to read it and provide support to Anna and write a review to give her book word of mouth before its release. When it came, I hesitated. I read the front and back covers, allowing myself only a few pages in on each end. I read the foreword and the acknowledgments, but then I saw the picture of Jack, his big brown eyes smiling at me, and I closed the book and placed it on my nightstand. I wasn’t ready for this. By then I knew the story, had known Anna long enough, and read enough of her blog to know the details of Jack’s death. I couldn’t bring myself to relive it with her, those early days of shock and grief. I was comfortable keeping Anna’s story just out of my reach. I wasn’t ready to know the reality of what happens to a person when their child dies. But one day I picked up the book, and read. This is not a superhero who wrote this book, who had this experience. This is a mom, a wife, a daughter, sister, and friend, a fellow homeroom parent, the woman behind you in the grocery line hoping to get home before her kids get off the bus. Anna is you and me. And she has so much to offer with her story. Namely, hope. Hope that continues on long after the shock of tragedy softens into mourning and memory, and spiritual battles have been waged and won for now. Hope in the knowledge that we are closer to our lost loved ones than we think. Hope that our love comes back to us in signs and words and sounds and knowing that life moves forward with new and wonderful experiences. 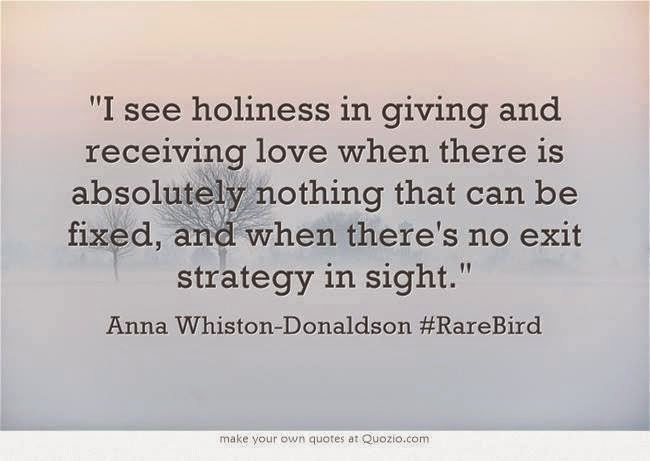 Rare Bird also offers love. And laughter. And the meaning of family, and friendships, and being a good neighbor, friend, wife and parent. But it also offers the opposite: tears, broken relationships, tested bonds, struggles with spiritual truths and anger, a loss that leaves a hole that cannot be filled. 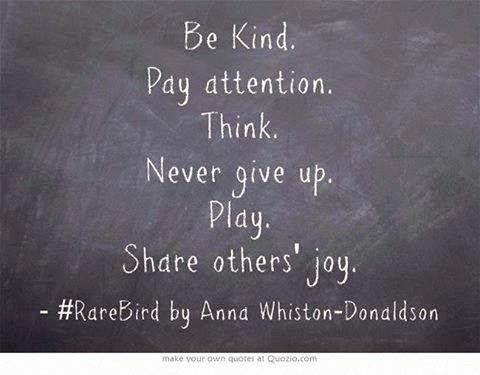 Anna offers the whole of human experience in the pages of Rare Bird. She scoots in close and shares her testimony, her confessions, her doubts, and her own failings and guilt. She trusts us with the precious memories of her son and her family and all that she learned and continues to learn and you can’t help but take it all in. The lessons Anna writes are not only for those who have experienced a loss. They are universal: how to show grace to your spouse. How to forgive yourself. How to open our hearts to people in our past. How to talk openly with others. How to love despite pain. Anna admits that she is not an expert on grieving and loss. She would say that she is not superhuman, that on some days she is not doing the best she can, and that she cannot understand why this happened to her son. She is a woman of faith, and questions God and his ways while clinging tightly to his promises and the scriptures that Jack held dear. She takes us through the details of those grim days immediately following Jack’s accident, and painfully recalls her confusion and despair over how he was gone, yet she was still able to stand at his funeral and speak of him clearly, strengthened by the Holy Spirit and not wanting to leave until every single person in the church was changed. Rare Bird taught me that heaven is closer than we think, that the reality of life is death, and that we owe it to ourselves and others to reach out and share ourselves as much as we can. We are to love with abandon, and admit when we are fragile and scared, and give ourselves and others space to move and to grow. I am still in awe of Anna and what she has lived through and what she continues to live through every day. But she is not out of my league. She is firmly within it, receiving the love and light that this life has to offer each of us, even through the darkness. Rare Bird: A Memoir of Loss and Love is available on Amazon. I don't want to imagine. Keeping her family in my heart. Anna and her family are in so many people's hearts. It's sad to receive such an awesome blessing because of such a terrible event, but that's what it is. This is wonderful, and a loving review, Andrea. Isn't Anna and her book just so easy to love? So eloquently captured: Anna's strength, Anna's wisdom, Anna's story that she unselfishly shared when she could have been so selfish with it. A beautiful, loving look inside those pages and reminder that Anna is us, you and me, as moms and humans. Her story could be anyone's story and yet, because it's hers it touches and changes us. Your words encapsulate so much of what I've felt - still feel - about Anna and her book. Her story has changed how I look at "showing up" for someone who is grieving. I was a 'give them space' person afraid that saying the wrong thing would make a painful situation worse. I didn't want to be seen as someone trying to jump on the bandwagon of a tragedy. I realize now that this is not how someone who is in the depths of loss feels. That saying the something is better than saying nothing...that being alone is worse than being in the company of someone who is awkward. This book changed me, too. It is miraculous - even though, as you said, Anna is simply a mother. That, in a way, is the hardest truth of all. She is any one of us. But there is hope in that, too. Oh, man, Julie! Your comment made me cry. I agree, Julie. 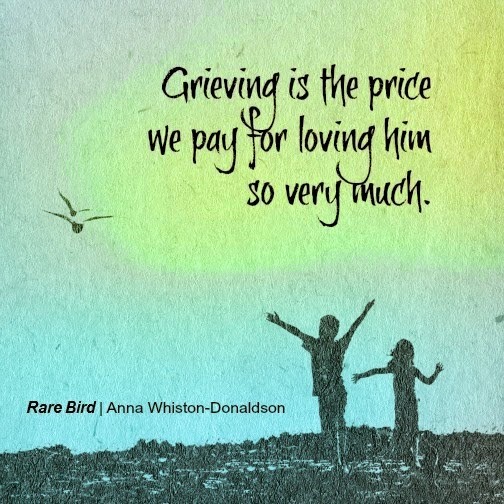 It has changed the way I think about those grieving as well. That is part of the reason I love it so very much! This is such a wonderful review of Rare Bird. You summed up the book, its themes, and Anna perfectly. Thanks so much, Leigh Ann. This book really affected me. I hoped to do it justice. What struck me the most is that you say she is US. Yes, this could be an of us. I am amazed at Anna as well. Thanks, Elaine. We are all so similar, and can learn so much from each other. I wish more people knew that.